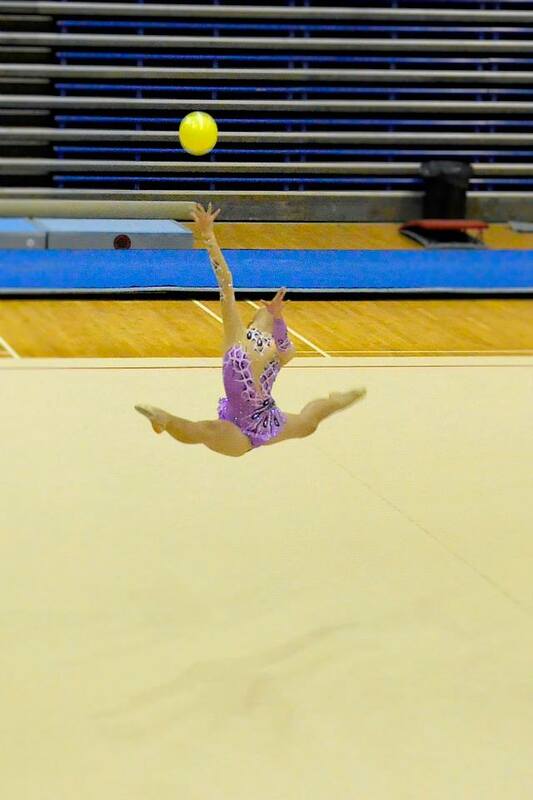 If you struggled with your NAPFA assessments earlier this week – and even if you didn’t – rhythmic gymnasts surely cut an impressive figure, with their effortless execution of feats of athletic and aesthetic mastery. 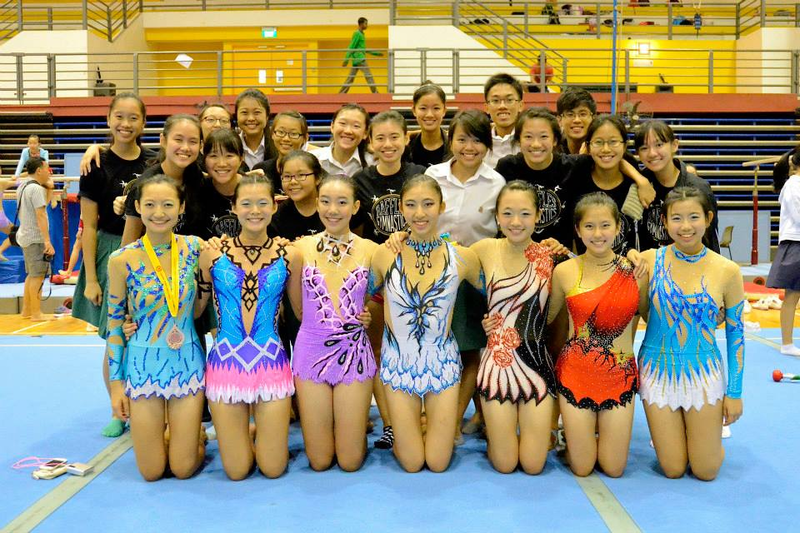 Last Thursday, our rhythmic gymnastics team of six competitors, decked out in sequinned leotards, were dressed to impress at the Bishan Sports Hall. They did the school proud, bringing back a total of five silvers and three bronzes. 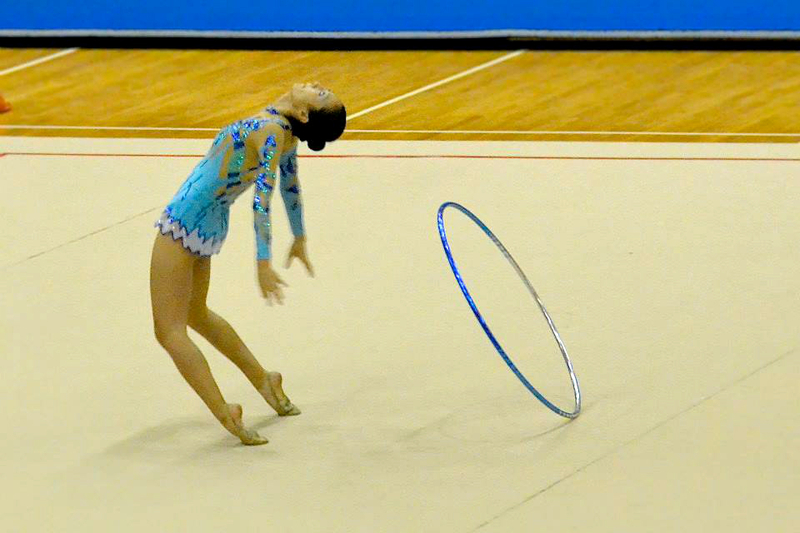 Rhythmic gymnastics is a sport with a performance element, making it a test of both gymnasts’ strength and agility as well as their elegance and aesthetics. Thursday’s optional routine category involved gymnasts performing an original routine, often choreographed by their coaches and set to upbeat tunes ranging from Oriental to Bollywood to pop. Their routines were scored based on the technical accuracy of execution as well as the difficulty of their skills; indeed, the D-score is often what makes or breaks a gymnast, though heavy penalties are dealt for mistakes like dropping one’s apparatus. Gymnasts perform with the use of any of four apparatus, ball, hoop, clubs, or ribbons, at a time. In addition, gymnasts who put up a routine for all four apparatuses stand a chance at earning a medal in the Individual All Around event. Juggling coordination, balance, rhythm, flexibility, speed, strength, control, style, audience appeal, and – of course – their apparatus, it isn’t hard to see where the challenge lies. As anticipated, Thursday’s performances were technically and visually astounding, from the coruscating leotards – which can cost upwards of $400 apiece – to the dizzying succession of pirouettes to the mind-bending over-splits that gymnasts flawlessly executed. Though there was certainly a spectacular range of ability on display, nobody was exempt from error regardless of experience. A fair number of clubs were dropped and balls were seen rolling out of the red boundary line. What was heartening, though, was the willingness of all spectators to cheer on competitors who had momentarily faltered, even if they were from rival schools. More than anything else, the competition was a celebration of the gymnasts’ passion and dedication for their sport. Having pulled a muscle in her thigh less than a week before the competitions, Megan was on painkillers that day, which limited her movement. 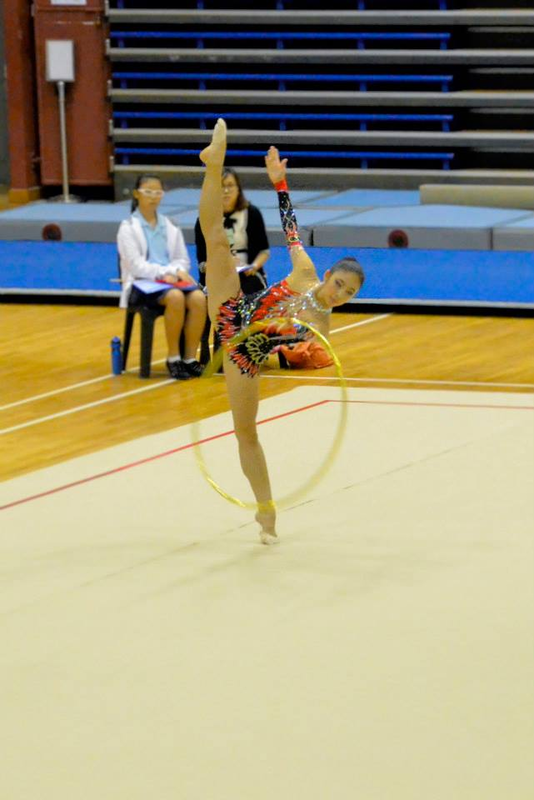 Nevertheless, the ex-national rhythmic gymnast remained undeterred and pulled off her ribbon and ball routines to place third for both events, displaying some remarkable flexibility along the way. For competitors Jolene Tan, Lim Wannee and Yan Zhixin, the competition was their first and last, having only taken up the sport a year ago. Despite their relative inexperience, they put up commendable performances, dexterously manipulating their respective apparatuses throughout their routines while maintaining a cheerful disposition and finishing strong. In particular, Jolene’s hoop routine impressed the judges, earning her the bronze with a score of 5.0, although her playful clubs routine set to ‘The Bare Necessities’ was thoroughly entertaining to watch and scored 4.42. 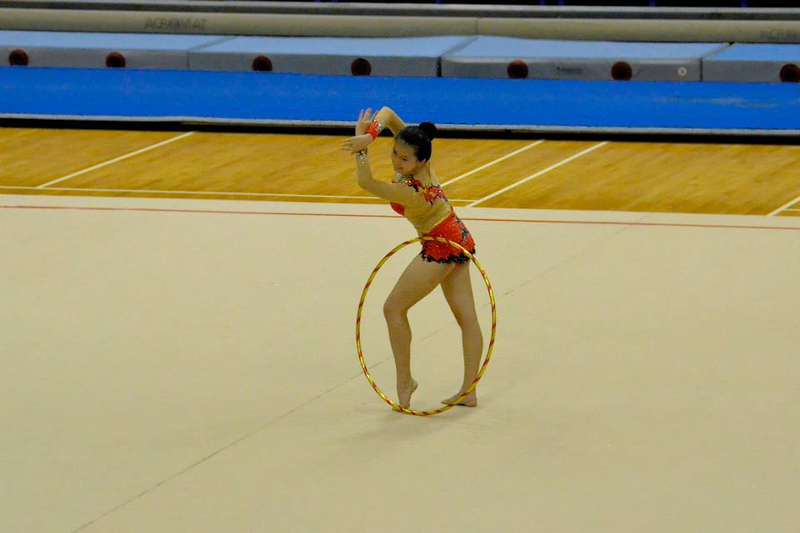 Wannee scored 3.78 and 3.95 on her clubs and hoop routines respectively, while Zhixin’s ball routine earned a 4.38. As for Daphne Chia, the competition was not without accident, but her briskly-executed routines, unfalteringly daring throws, inhuman feats of flexibility and elaborate, spangled leotards left us quite literally starstruck, earning her all five silvers in the competition. 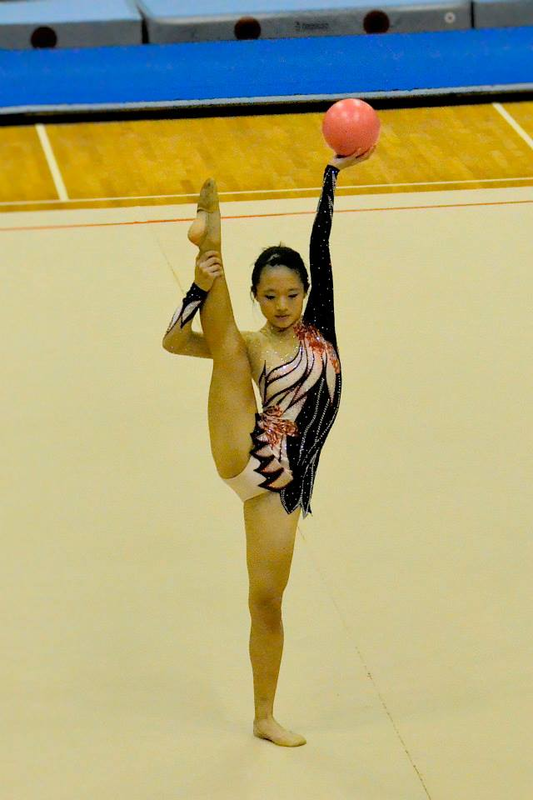 After the day’s gruelling competition and the succession of four routines, she was beat by fellow national gymnast Tong Kah Mun, who swept all golds. She graciously acknowledged, “This year, it was quite an intense competition between myself and my teammates from the national team. 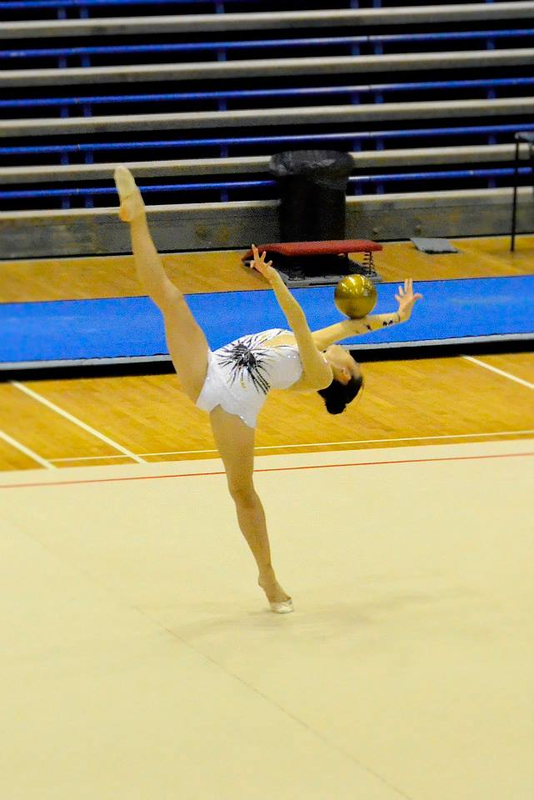 I’m really glad that my teammates from Raffles did well, though we don’t train together.” Daphne will be representing Singapore in the upcoming Commonwealth Games 2014. Raffles Girls’ Secondary School representative Dawne Chua Yun Xi also did Raffles proud by clinching golds in the ball and hoop events.